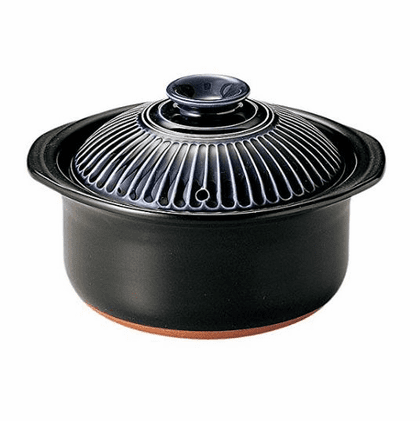 This chrysanthemum design Banko Yaki earthenware rice cooking pot has thicker layers and makes fluffy, glistening rice and is great for making plain rice, Takikomi gohan, variety of vegetable dishes and Miso soup. Gas cook top, microwavable and oven safe. This pot has an inner lid, which creates extra pressure and stem and helps to prevent messy spillover while the rice is cooking. From the manufacture directly translated from Japanese to English. Cooking instructions: First, wash rice thoroughly and then put into the pot. Use the lines inside the pot as a guideline for the amount of water. Please use the following guideline for the amount of water to add when cooking white rice. This is a rule of thumb. Please adjust the amount of water base on your particular rice and preference. Soak the rice for at least 30 minutes. This is very important when cooking with this pot. The optimal soaking time will depend on the quality of the rice. Place cover inner lid on pot, next place outer lid on. Now you are ready to cook. Shutoff time is about 30 seconds after steam starts blowing out of hole on the top lid. However, you can extend about 1-2 minutes if wish to have a tasty okoge which is crisp toasted rice at the bottom of the pot. With the heat off, let rice continue to steam for 20 minutes. DO NOT lift the lid during this time. After the rice has cooked, remove the lid to allow any remaining steam to escape. Fluff up the rice thoroughly with wooden shamoji or plastic spatula. Carefully fluff up without smashing down rice. Always protect your hands with oven mitts and pot holders when handles are hot. Use wooden trivet to protect countertops and tables. Wash pot with soft sponge or tawashi in warm water after cool down. Rinse with water and dry well before store the pot. 8-3/8 inches long with handles (21.5 centimeters long with handles), 7-5/8 in diameter (19.5 centimeters in diameter), 5-7/8 inches tall (15 centimeters tall), 4.2 pounds (1.9 kilograms), 40.5 fl. oz. (1,200 cc capacity) $69.95 item #190808.